Our research group is doing a panel at the ELO conference in Paris this September about ways we can use the ELMCIP Electronic Literature Knowledge Base to better understand the field of electronic literature. I’ve been tasked with going through the 60 or so PhD dissertations on electronic literature that we’ve collected information about so far, entering information about creative works of electronic literature that they reference, and doing a network analysis of the creative works. 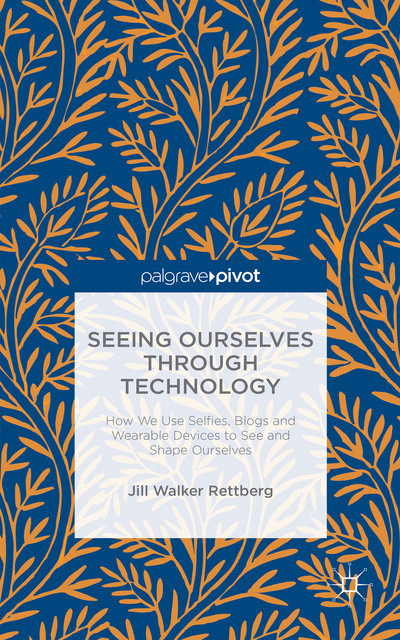 The idea is both that this might tell us something about the kinds of works that scholars are writing about today and perhaps give us an idea of which are the most influential or important works of electronic literature. 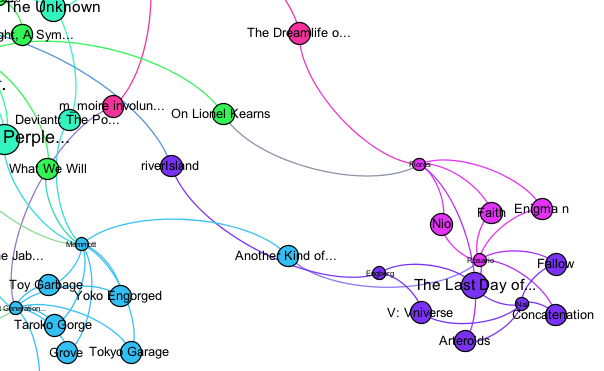 A rough network graph of creative works referenced by at least two dissertations on electronic literature. Click on the image to view a bigger version. Here is a first pass at a network visualisation of the creative works that are referenced by at least two separate dissertations. You can open the image in a new window to see it a bit bigger so you actually have a chance of reading the titles of works. Works are sized according to the number of references they have received, so you can see that afternoon, a story is the biggest – no surprise there. The colours were determined by a modularity algorithm and the layout by the Force Atlas 2 algorithm, all using the open source Gephi software. I actually just printed this visualisation out and scribbled on it in pencil to get some ideas of how things fit together, so it’s a very early version, but you can see how the network visualisation clusters works into genres. 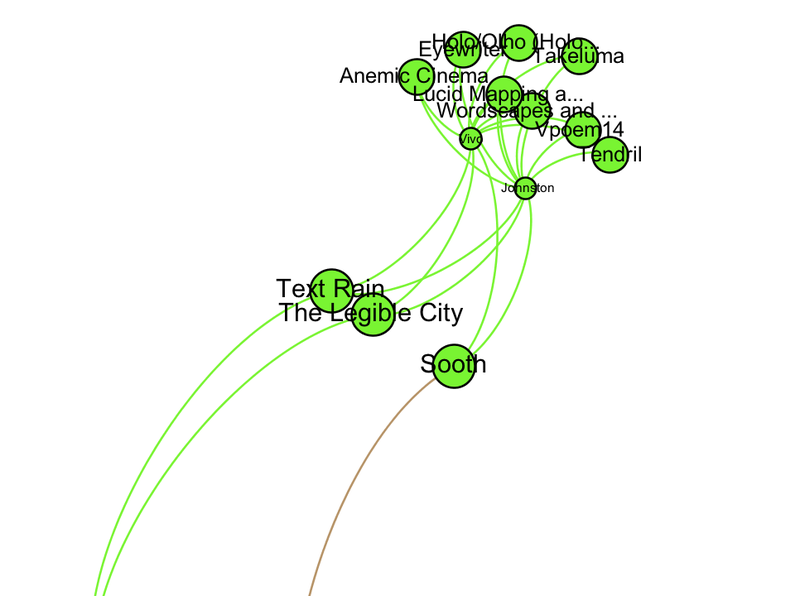 Some are very clear, such as the interactive fiction over to the left of the graph. 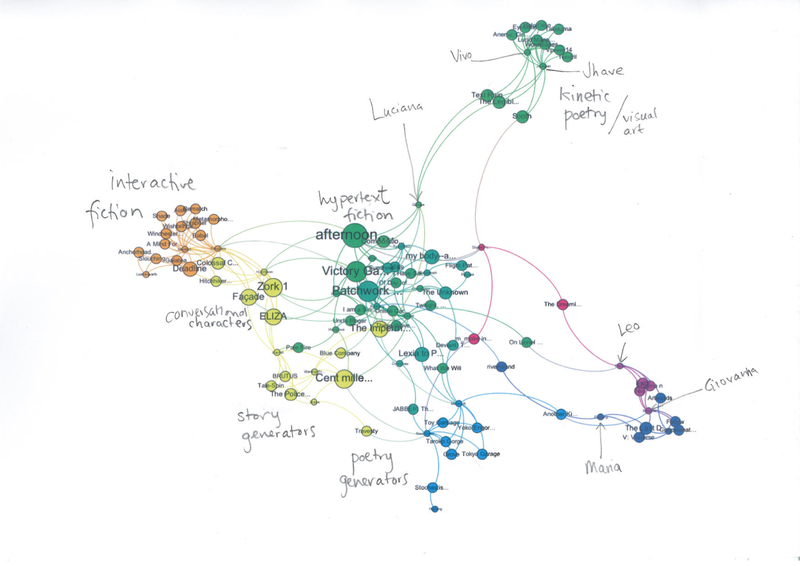 The works shown in orange were cited by dissertations by Montfort (2007), Douglass (2007) and Leavenworth (2010), who all wrote dissertations very much focused on interactive fiction. You can see how some of the works of interactive fiction are bridges to other clusters, though, in particular this is the case for the classics – Colossal Cave Adventure and even more so Zork, but also The Hitchhikers Guide to the Galaxy. It’s interesting to see Façade and ELIZA fit in here too: both are strong examples of conversational characters. I think what happened here is that so many people reference these works that they become the heart of electronic literature, as it were. The most-referenced works here are the famous early Storyspace hypertext fictions: afternoon, a story, Victory Garden and Patchwork Girl. Other highly cited works also cluster in here – such as My Body, The Impermanence Agent and Lexia to Perplexia. The littlest nodes are actually the dissertations, so you can see Dave Ciccoricci’s (2005) is in there, and Roudabush (2012), Husárová (2009), Wood (2011), Rustad (2008) and mine and Scott’s as well. (2013) function as bridges, citing both the visual/kinetic poetry works and the denser cluster of classics below. The bottom right cluster could perhaps also be described as visual poetry, or kinetic poetry, or perhaps better as interactive poetry, as suggested by Leonardo Flores, author of one of the dissertations that anchors this cluster (Flores 2010). The modularity algorithm coloured this cluster pink and purple, with Flores’ work on Jim Andrews sectioned out in pink, but the layout algorithm clustered them all together. 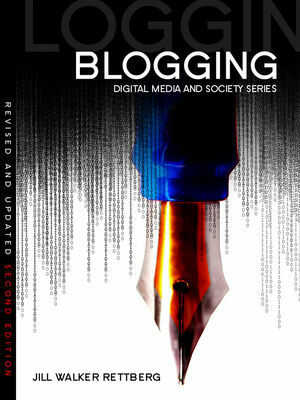 In addition to Flores, Engberg (2007), Naji () and Rosario (2011) are the dissertations that gather these works. All four cite The Last Day of Betty Nkomo by Young-Hae Chang Heavy Industries, which appears to be quite a hub – yet is clearly an example of non-interactive but very visual poetry. I guess I’ll have to look more closely at the actual works to really talk about whether these clusters really show genre. The paper for ELO was supposed to be finished already, but this kind of research is so different to the kinds I’ve been used to doing that I’ve really not got as far as I would have liked. Obviously, I’ve only analysed 28 rather than about 60 dissertations – but when we started the work we thought we’d only have about 20 dissertations, so the possible corpus has grown as we have explored! I think even with this relatively small number of dissertations we can see some interesting patterns. And I’m looking forwards to adding more data and seeing whether that confirms or changes what we’re seeing so far. Please do let me know if you have any ideas or comments!! I’m also happy to have refuted the claim that scholars are more interested in discussing theory than actual electronic literature – there is a lot of literature discussed in these dissertations. And I’m thrilled to discover that there is such immense diversity in what literature is discussed. To finish off for now, here is a list of the twenty most cited creative works in the 28 dissertations I’ve analysed so far. Remember, looking at this, that there are a total of 341 separate works discussed – this is merely the tip of the iceberg! Interesting! What tools do you use to code the references and to analyze and visualize the network graphs? Hello! 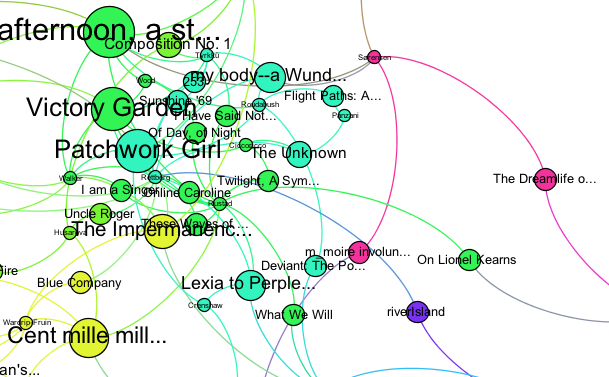 I use the ELMCIP Knowledge Base to code the references (it’s a Drupal based database) and Gephi for the visualisation.